Be the Hero – defeat the Archenemy before Metro City is destroyed! Choose your own combination of super-power cards as you play. Each player represents a super-powered Hero of their own design who must stop their Archenemy’s nefarious plan to destroy Metro City. To succeed, the Heroes must do battle with hordes of Minions, diabolical Villains, and the Archenemy who leads them! The more Energy and Powers a Hero develops, the closer they get to defeating their Archenemy. But time is running out! For every moment the Heroes delay, the forces of evil destroy more of the city the Heroes are trying to save. DEFEAT YOUR ARCHENEMY! The first player to defeat the Archenemy wins the game... unless the Archenemy destroys so much of Metro City that there's nothing left to save! CUSTOMIZE. DEVELOP. REPLAY. Devastate your enemies with thousands of possibilities and choices for your character. The base game includes over 20 explosive Power cards and many iconic Energy Sources. A randomized subset of these will be selected for each game. It's an exciting array of possibilities for your customized super-powered Hero. TELL A STORY. In Heroes of Metro City, we encourage our players to name their Heroes and describe the action as they play their cards. No, it's not required, but it sure is a lot more fun. David Boostrom, lead game designer, shows how to play the game. If you read my review of Sentinels of the Multiverse – it should be apparent I am a CapeGirl and I mention there the flood of spandex that has washed ashore in the Card Game/Deck Builder genre. Honestly, I don’t mind one bit. Each one brings something to the tabletop. I’ll probably review each one in depth and in turn. Sentinels (The Deck Player): Fight Archetype Baddies with Archetype Heroes – all with unique play style and flavored decks. Capes Undiluted! Sentinels ‘ssemble! DC Heroes (The Hodge Podge) Sure you are Bats wielding an Aqua Trident while flying an Invisible Jet. Thematically it’s ‘DC ****?’ But if you squint, it is what it is: fast, easy, furious Ascension style deck building fun with a whole bunch of card variety. Legendary (The Marvel Team-up Collection) A force funnel deck builder where you carefully choose your team (play style) for any given game which focuses just as much on the Schemes and Masterminds as the Heroes. But today’s walk through the Paneldom is taking us to the Indie comic rack and the Hai Mind is looking at Heroes of Metro City . What some might consider a minor league game (Kickstarter Indie), but with a major league experience in Heroes, Vills, and most importantly – Gameplay. What HoMC brings to the deck builder’s tabletop is Hero Building. You are literally constructing your hero with the cards you ‘buy’. You choose your powers. You choose your play style. You see if you have what it takes to take on the baddies. ENERGY – Semi-permanent play cards that allow you to activate your POWERS on a given turn. DAMAGE – How much you can punch the baddies in the face for while attempting to take them down (until they come back 10 issues later). PLOT POINTS – Your ‘buy’ currency – allowing you to purchase new cards from the supply decks and add to your own. HoMC uses the Static Grid (aka ‘Village’ – in this case ‘The City Supply’) set-up for the supply decks (as opposed to ‘Conveyor’ system of a continuously rotating supply pool ala Ascension, DC, and Legendary). The focus of the game is building your hero while defending The City against havoc caused simultaneously by 3 sets of Enemies. Minions – These are the lowlifes. Literally. They have low life. 😉 Thugboys. Rogue Robots. Lone wandering Ape Men. A hero has to start somewhere. Villains – Mayhem Middle Management. These are the guys silhouetted on a comic cover going ‘Hey, remember me!’ Once a year they stretch their legs, pop a fishbowl on their heads, and try to rob a bank. You are working up to them, and better make it sharpish. Left too long and they will slowly chip away at your available supply decks while causing general pain in the tights per turn. A game turn plays out in 6 quick phases. 1) Reinforce Enemies – any Minions or Villains defeated on the last player’s turn? Flip a new one over to see who’s up to no good. 2) Activate Powers – This is where the Energy and Power cards you drew this round come into play. Slot an Energy Source Card: Energy cards are semi-permanent plays. You can place them on your player mat and they stay from turn to turn. They have a given Energy Level (1,2,3 etc) and your Power cards have a given Energy Requirement. Activate A Power by attaching it to an Energy Source with enough juice and you are X-Factored and can use whatever abilities are on that card. You can slot Energy Sources from your hand to Energy Sources on the play mat for a little extra spark in a given round and some Power cards provide an Energy Slot at the bottom when activated so you can create minor chains of Powers. 3)Battle Enemies – It’s Clobberin’ Time! Add up the given Damage you can deal via activated cards this round and compare it to the Life Points of the current cast in the Rogue’s Gallery. Equal to or greater and they are defeated. Enough total damage and you can take out more than one enemy in a round, but it’s all or nothing. Come up short and they remain in play (and we’ll see what happens in a moment). There’s no weakening an Enemy unless a card says otherwise. Defeated enemies are either added to your hand and provide an instant boon (usually Plot Points) and then discarded as usual to boon again next time they roll around or are permanently discarded to the Rubble Pile so as not to clog your deck. 4)Story Development Standard buy phase. Any remaining cards in your hand that provide Plot Points and Plot Points generated this round are used to Develop (buy) one card from the City Supply which is added to your discard. 6) Clean up Standard deck builder clean up. To the discards with you! Play mat Slotted Energy Sources (not boosts)can remain or be discarded by choice. The game ends when one player can generate enough damage to defeat the Archie and pops him one in the death ray and is declared Top Cape or when Mr. Big Bad goes to destroy a card from City Supply and there are none of that type to be had and the Hero is unable (or unwilling) to make a Heroic Sacrifice. As long as the Archenemy’s Destructive Power can destroy at least one card, play continues. Art: A deck builder needs decent art. You are going to be looking at those cards again and again. Moreso, a game of comics and capes needs decent art. HoMC delivers. The styles on each individual card do run a gambit from Golden Age bubble gum to slicker, darker modern Graphic Novel but it fits. The art is a nice nod and sometimes a wink to the panels and pin-ups of Comicdom. Variety: The Power cards have enough variety that you can build a nicely themed hero out of whatever the randomizers give you (most of the time). Some might frown as the Static Grid of the City Supply pool can be limiting – but it forces you to focus on and utilize what options you have in order to build the best hero you can be. This is a deck builder about hero building and the Static Grid works best for it. No Bats with an Aqua Trident here. Gameplay: Turns are fast and intuitive. After a few rounds, it is easy to settle into a buy choice pattern so the buy phase doesn’t get ponderous. There can be an occasional clog when ALL the baddies roll for Evilness and you have to make some tough decisions about what to whittle down in the City Supply. Tension begins to build rather quickly after a half dozen turns or so and those City Supply decks start to thin. Even heroes stop to think ‘Can I pull this off?’ on occasion and then dive back into the fray for better or worse. Variety: Some people are going to find the Static Grid limiting no matter if it works best or not. Sometimes the randomizers are going to set you up, if not for defeat, way way way down in the hole. Think Thunderstone without any light sources. The Baddies: Yup. Sometimes they are going to kick you back – hard. Again and again. You will lose. It ain’t easy being a hero. Components: The cards are a little ‘Kickstarter Bendy’ as I like to say. My major OCD teeth grind is with the tray. I hate deck builders with those dimpled trays. They never work. The cards always flop about and if you sneeze at this particular one they shift all over the place. I have carefully placed this box on the shelf like an angel on the head of a pin and no matter what, next time I take it down an internal exorcism has taken place. Do not waste precious money on molded plastic trays. Two cardboard troughs,divider cards, and foam bricks never fail. Divider cards with unique art and names printed on the top are money better spent. I’m looking at you Legendary!!!!! A 10! Come on! REALLY????? I usually give a +1 if a game sticks to its theme and accomplishes what it sets out to do. Any deck builder is a deck builder. They have built in flaws by design. You are going to draw lousy hands. You are going to have useless rounds where you can’t do anything. You are never going to be able to get that card you covet. It’s the nature of the beast. Even the best deck builder is going to get gummy and clunky from time to time. The name of HoMC is Hero Building and in a way these imperfections fit. You are building a hero from the ground floor up and in a sense the tension of ‘If I can just buy that card soon…’ or ‘If I can just get this draw…’ while the villains hammer away at the city fits the bill. You aren’t that guy with the nifty car and the nifty cave with the nifty computer and the nifty borrowed Aqua Trident. You are trying to be THAT guy and it takes time…and time isn’t on your side in the hero game. Villains keep making that clock tick. The best of deck builders can only be perfect in their imperfections and that’s a ‘9’. HoMC brings something unique to table and to the cape theme. It sticks to it – no matter what – just like a true hero. That’s a ’10’ in my book. 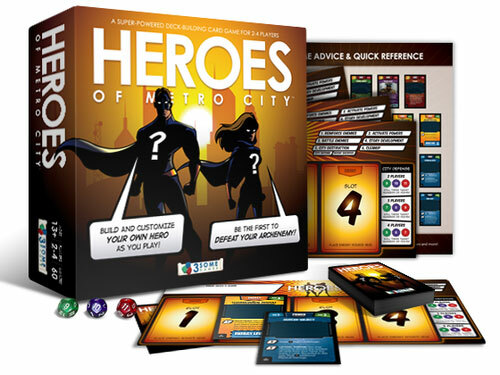 -While some of its design may be counter intuitive initially, Heroes of Metro City is a fantastic and fresh deckbuilder dripping with superhero theme. A must play for gamers excited to create personalized heroes and who like a challenge that demands smart tactics from the first draw. -Heroes of Metro City is a cooperative/semi-competitive Thunderstone style deck builder. As players are victorious against lower level foes, they will develop their own personalized backgrounds and powers by choosing from an array of randomly drawn options. However, time is not on the player’s side. While heroes scrap with underlings and develop their abilities in battle, more powerful villains cause unrelenting havoc tearing the city down around them. Will the heroes become the paragons and legends they will need to be in order to defeat the archvillain in time? That is the story that unfolds with each draw and play. -The top selling points for the game are its novel slotted energy and power system, adept use of theme, and focus on letting players create a unique and personalized hero. The number of villain and power combinations provides a high level of replayability and I found that each game proved to be a distinct challenge to overcome. -The components are exceptional for a freshmen studio effort, and while they aren’t Fantasy Flight quality pieces and parts (few are), they are not far behind. The fantastic art is also worth noting. The original comic artwork is plentiful and professionally done. While a number of artistic styles are used, some which may appeal to you more than others, a consistent level of high quality is maintained throughout. What are the games challenges? -While I described the game as a Thunderstone style deck builder, it is that similarity that can cause frustration. While the game appears to build on the design of other games, its mechanics differ in ways that if not immediately grasped can lead to a less than fulfilling experience. Tried and true deck building strategies do not always apply. -Elements of the design, while elegant and effective in practice, can be counter-intuitive. Sometimes you don’t want the city defense to succeed, a heroic sacrifice is often a very desirable thing to do, at times you will deny yourself the spoils of defeating bad guys in order to keep your deck lean. All of these elements work very well in the game, however, they also present a potential barrier to entry for deck building veterans. -I’m a big fan of HoMC! It frequently comes to the table, though that was not always the case. I’m very happy I gave the game a second look, and did so from a fresh perspective. Once I had a feel for the game the fun of creating my own heroes, discovering combos and racing against the challenging villains (and sometimes more difficult drafts) has led to many a great evening. I own and consider the other ‘big three’ hero games on the market some of my favorite games, and strongly feel that HoMC fills a unique niche among them. 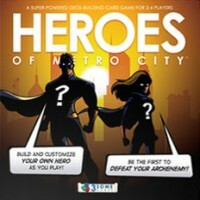 I highly recommend comic fans, deck building gamers, and comic art aficionados give Heroes of Metro City a try. Add a Review for "Heroes of Metro City"